Summary: Estimate how much it costs to build a house in Tucson Arizona by using construction cost software. I have purchased a set of house plans and was wondering if you could give me an estimated cost to build for them. I am building in Tucson, AZ area code 85743. The other issue is that this will be built on 10 acres of land that is located in flood plain. I did an estimate for this beautiful stucco home for the Tucson, Arizona area. Using the Building Cost Calculator found on cost estimating software page, I came up with a total cost of $476,156 or $118 per sq ft. The total cost includes a General Contractor markup of $54,360. This estimate includes a slab foundation on grade, as required for normal land conditions. Note: Since this house is being built in a flood plain, as per your letter, flood insurance will be required by the lender. Also, the local building codes may (should) require a raised slab to a height determined by code. This will increase the cost of the foundation. 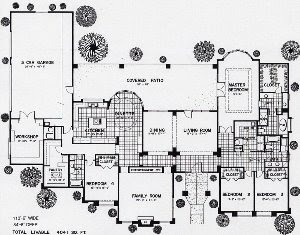 Plan 4041, John T Pela & Associates, Inc.,Architect, A.I.A. *The perimeter of the building has 10 or more corners. *The living area is 4,041 square feet. *The number of stories is 1. *Garage: 1000 square feet of attached garage under the main building roof, same finish as the home interior. *Patio: 1026 square feet of surface. *Central ducted heating and cooling. *1 each insulated prefab metal fireplace, brick face. Note: The cost of the land, government-mandated site development fees (impact fees) and the cost of bringing utility lines to the site, plus any additional permits, or additional costs are not included in the cost to build the house. Cost estimates change with time. YOU can update this 2018 estimate to see if it has, as well as experimenting with different building quality inputs that affect the cost to build. Keep in mind that these estimates are approximate and are just a guide. Until you actually start getting your own bids and estimates and entering them into your own spreadsheet (see my spreadsheet page for FREE spreadsheets), they will remain approximate. How Much Does Cost To Build a House In California?